Compliance – Am I Doing It Right? The Health and Safety Executive [HSE] are looking to ensure that relevant groups are complying with the current version of the asbestos regulations, the Control of Asbestos Regulations 2012 [CAR2012]. Compliance issues are broad ranging and very likely to effect everyone that may come across, manage or work close to asbestos containing materials [ACMs]. We are happy to initially identify with you your current position regarding compliance with the C’Control of Asbestos Regulations 2012, whilst taking into account your other legal duties. Effective management and compliance has much more than a cost – it holds value by securing the health and safety of you, your workforce, colleagues and members of the public from the dangers posed by asbestos. Remember, a full register of survey or inspection information will not manage the risks identified on its own! Information requires systems through which it can operate – let us help you get these systems in place. Regulation 4 of the CAR2012 does not legally require you to ‘survey’ your property or portfolio… but it does require you demonstrate effective management of asbestos, from policy through to procedure, dissemination of information, effective action plans and training. The types uses and likely occurrence of asbestos and ACMs in buildings and plant. The procedures to be followed to deal with an emergency. How to avoid the risks from asbestos. 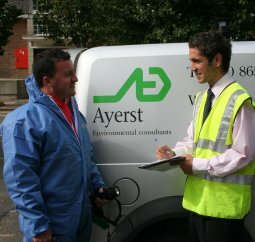 Ayerst Environmental, as part of its drive to get people compliant, will be happy to visit you or your management team to briefly discuss any concerns you may have regarding your legal position, and whether your position is robust should problems arise as a result of an asbestos incident. Please call or Email Us and ask to speak to one of our senior consultants. Ayerst Environmental has been appointed to the role of Asbestos Coordinator [or equivalent] for several Clients including Housing Associations, Local Authorities and other commercial organisations. For more information on how we can assist, please call us on 020 8658 8050.